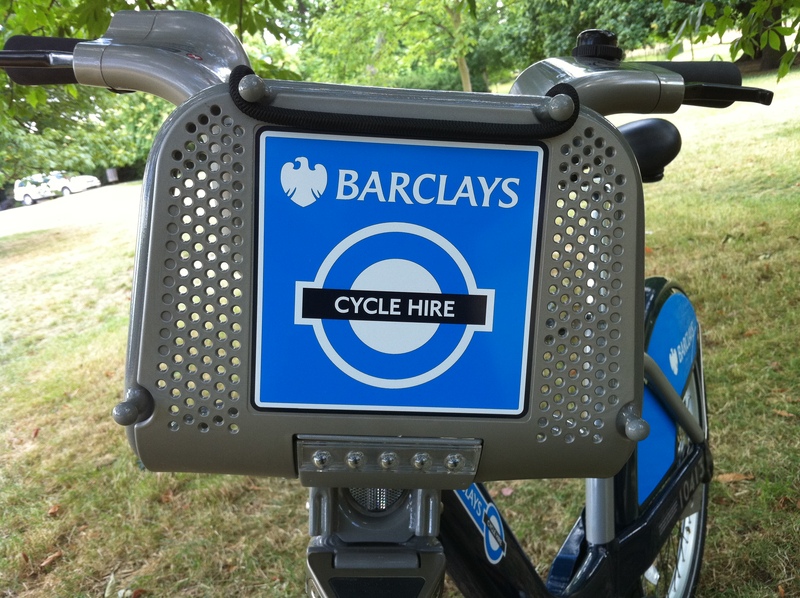 TFL have given me the chance to test ride the Barclays Cycle Hire bicycles that are soon to be released in London at the end of July. My first feeling when i got on it was strange but that was down to me normally cycling a carbon fibre racing bike with narrow handle bars. The cycle hire bicycles take on a more dutch look and feel, with a more up right seating position and wide handle bars. Obviously it’s not the fastest bike I have ridden, and is rather heavy due to its frame type. 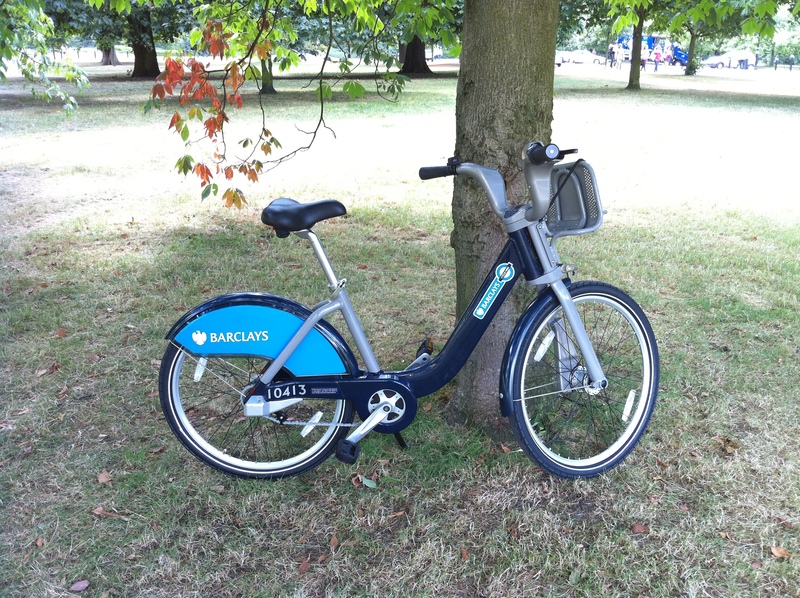 The 3 gears provided are enough for London cycling and provide a comfortable cruising speed. The upright position puts you above general traffic and you have a great view of the road up ahead. Your body position is positive and due to the general slow speed and low effort, you’re cycling along with a smile on your face (at least I was). The bike has some LED lights on the front and back, which start flashing when the bike starts moving. After stopping they stay on for around 2 minutes. Reflectors are also provided on the front and rear, as well as pedals and wheel reflectors. Pretty much perfect for city night riding under street lamps. The handle bars where comfortable to hold and the brakes had a good feel to them. The stopping power wasn’t amazing, but it would certainly stop you quick enough for the speeds that the bike can manage. The saddle was nice and wide and felt comfortable over the distance I managed in 40 minutes. It may not suit everyone but this design is best used for the application at hand. 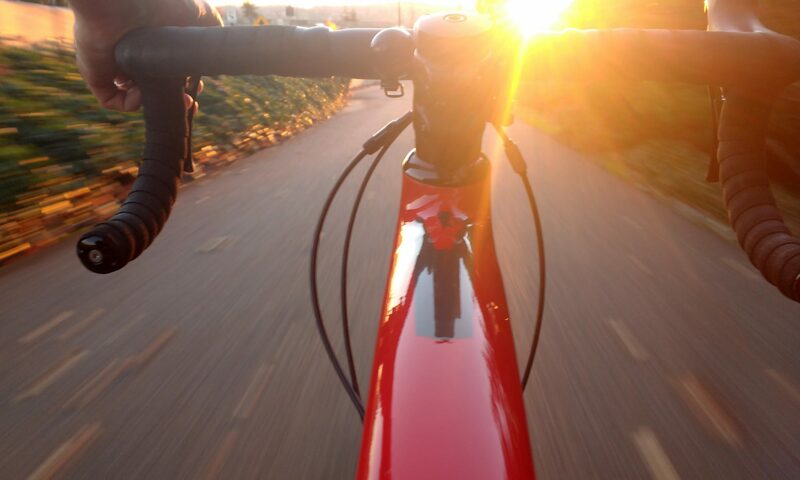 The saddle height is easily adjusted via a quick release and numbered lines on the left hand side mean that you can easily put the saddle back to a position comfortable for you when you pick up a new bike. The tyres where nice and wide and provided good grip, I felt totally comfortable over even the worst of potholes, the only problem I did face was badly cobbled streets. It was uncomfortable but manageable, unlike any racer. Several information signs are provided on the bike, displaying information such as which brake is which, how to dock the bike, how to report a fault and what not to do at junctions. My only issue with the bike is the pedals, they are made of plastic and I didn’t have great grip in my trainers or my loafers. On a few occasions where I changed down a gear by mistake, my foot slipped of the pedal and gave me a bit of a shock. Definitely not something that I’m used to, but that may just be down to my personal cycling history rather than the pedals them self. Whilst out cycling on it, I got plenty of people looking at the bike and a few people asking me questions about it. One other cyclist was even jealous that I was on it and she couldn’t wait for the launch date. My overall view of this bike is very good. But that is only when looking at the goal of the bike. And that’s providing people with a cheap, easy, and simple way to get around London. The idea is great, the bikes are great and I will no doubt be using them during my lunch brakes to get further away from the office without worrying about locking my bike up against some railings. Awesome to get a pre-test. I got one of these too and must say I thoroughly enjoyed it. Can’t wait till they are all over London. I was impressed. I definitely think i will get getting the annual subscription. I can see my self popping all over the place on these during my lunch hour. 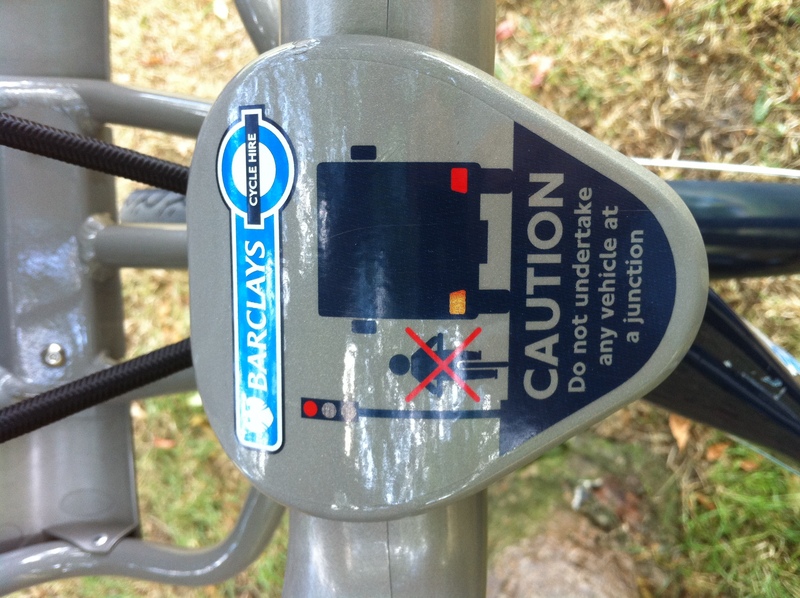 It seems odd that the sticker suggests that overtaking is bad, whilst the text attempts to prevent undertaking. Its a shame we got them from a Canadian company; they could have become British icons if they had been from Pashley, lugged frames and painted post-box red. At least the spec seems right though. It only suggest that undertaking at junctions is bad. Great review, hopefully it will be a success and other cities across the UK will take up the idea. 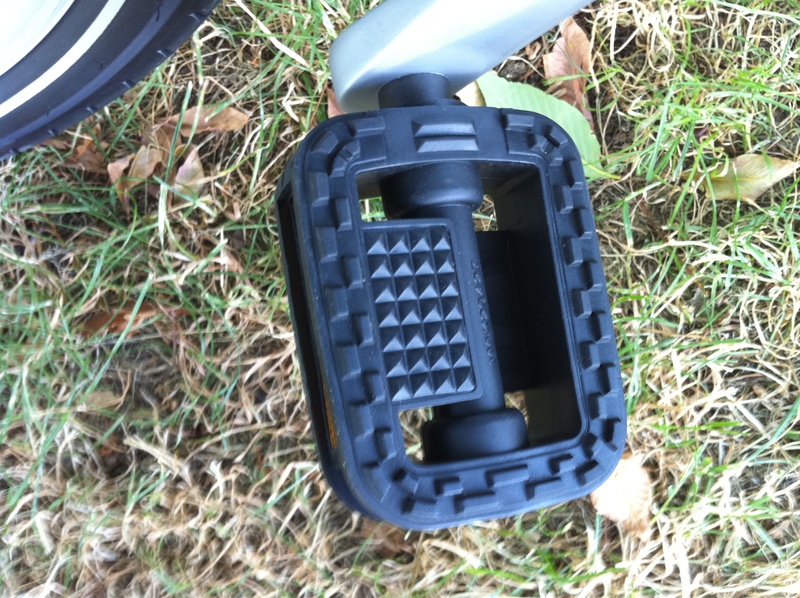 The plastic pedals are a bit of an issue as they can get slippery when wet, especially once they become worn, hopefully they will replace them with metal ones soon.